After being arrested for DWI, a police officer will read the citizen accused their "Statutory Warnings" before asking them to submit to a breath test. 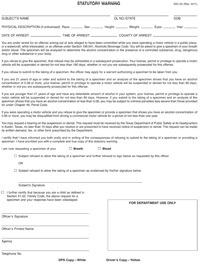 This form, the DIC-24, goes through the warnings to a person discussing potential license suspension for refusal, failure, and hearing requests. It was originally created as a "dummy proof" form so that officers weren’t illegally coercing people into giving breath or blood samples. The DIC-24 is often criticized by DWI attorneys as overly complicated, and in some cases, flat out deceiving. Judges STILL know to refuse breath tests! In yet another showing of solidarity, a recent Dallas Civil Court Judge refused to take a breath test after being arrested for suspicion of DWI. His answer to the officer was "not until I get some water and insulin". Do you think the officer obliged, or just charged him with DWI? This is just one of a long line of people who know the system, and refuse to take a breath test on the State’s often faulty machine. You can read about other Judges refusing breath tests HERE. Along with judges, the police refuse breath tests as well. Along those lines, Mark Bennett has been blogging about what the Police know that you don’t know (not even talking to the police during their investigations). In a new law enacted at midnight tonight, Arizona will require all first time offenders convicted of DUI to install an ignition interlock device on their vehicles. The Arizona Republic Online reports that not only will 1st time offenders be required to install this device, but also, anyone whose BAC is over .20 will have a mandatory jail sentence of at least 45 days. Hardest hit are first-time violators and a new class of "super extreme" DUI offenders whose blood-alcohol concentration registers 0.20 percent or above, which is more than double the legal limit of 0.08 percent. Intoxilyzer 5000 Source Code — One step closer?? Man charged with drunk driving says his attorney needs access to the source code to fight the charges; state supreme court agrees. The Police Know to Refuse the Tests… Shouldnt You? In a recent arrest in Ohio, a police officer was arrested after driving erratically. What I find most interesting is that he refused to submit to any chemical testing…. Hmmmmm…. It is interesting when many officers "encourage" or bully people into taking these tests, but when push comes to shove, they refuse. Is it really possible that only DWI attorneys know there is a fallacy with these tests? Or is it at all possible that the police as well realize that there is a problem here? Detective Kris Hanzel, of the Akron police force, was pulled over last week when he was seen driving erratically. He was off duty at the time. Officers report that Hanzel refused to take an alcohol test or any drug tests. Hanzel, who has been a member of the department for 14-years, turned in his badge and resigned his post the day after his arrest.